Here’s a summary of our latest CityReport: Lost in Place: Why the persistence and spread of concentrated poverty–not gentrification–is our biggest urban challenge. Lost in Place traces the history of high poverty neighborhoods in large US cities, and constructs a new view of the process of neighborhood change. This article summarizes some of our key findings. A complete guide to our report, including a PDF of the report narrative, sortable tables of metro area data and links to our neighborhood level maps are available here. We were drawn to examine this question because of the concerns that are frequently raised suggesting that efforts to promote urban revitalization have the unintended negative consequence of making life worse for the urban poor. The argument is made that improving a neighborhood simply results in one population (wealthier, whiter) moving in and the existing residents (poorer persons of color) moving out, with the result that the poor are worse off than they were had no revitalization occurred. There are some well-known examples of places that are now very high income–like Chelsea in Manhattan–which were once poor neighborhoods. But the question is seldom asked: How representative are these instances? And how prominently do they figure shaping the overall pattern and prevalence of urban poverty? The term gentrification itself is fraught with discord. It is widely used and seldom precisely defined. In this study, we’ve set out to shed some light on the question by focusing on a single index of neighborhood well-being: the poverty rate. Despite its flaws, the poverty rate is a good marker of a neighborhood’s relative economic status over time. Moreover, critiques of gentrification flag its harm to the poor, so logically, we should find the most dramatic effects of gentrification in high poverty neighborhoods. There are very good reasons we ought to be concerned about the plight of those living in high poverty neighborhoods. A growing body of social science research confirms that concentrated poverty magnifies all of the pathologies associated with poverty. Most troubling, new research shows that these effects make a major contribution to the intergenerational transmission of poverty: children growing up in neighborhoods of high poverty have permanently impaired life chances compared to otherwise identical children growing up in neighborhoods with low poverty. Our data show that while striking when it happens, instances of gentrification of previously high-poverty neighborhoods are quite rare. Only about 5 percent of the poor living in urban high-poverty neighborhoods in 1970 would have found that their neighborhood saw its poverty rate decline to less than the national average four decades later. Three-quarters of high-poverty neighborhoods were still places of high poverty four decades later. But they were far from stable; on average these chronically-poor neighborhoods lost 40 percent of their population over four decades. High-poverty neighborhoods are not stable or sustainable; they are in a steady process of decay. It’s an illusion to suggest that in the absence of gentrification, a poor neighborhood will remain the same. If we’re concerned about the poor and about concentrated poverty, our attention should be riveted to a much larger and more ominous trend: the growth of new neighborhoods of high poverty. Between 1970 and 2010, the number of urban neighborhoods with poverty rates exceeding 30 percent nearly tripled, to 3,100, and the number of poor persons living in these neighborhoods doubled from 2 million to 4 million. A majority of these newly-poor neighborhoods were places that in 1970 had poverty rates below the national average–places we call “falling stars.” They were arguably middle class 40 years ago, and today are neighborhoods of high poverty. The sheer scale of the spread of concentrated poverty emphasizes how modest the effect of gentrification has been on the location of the poor. 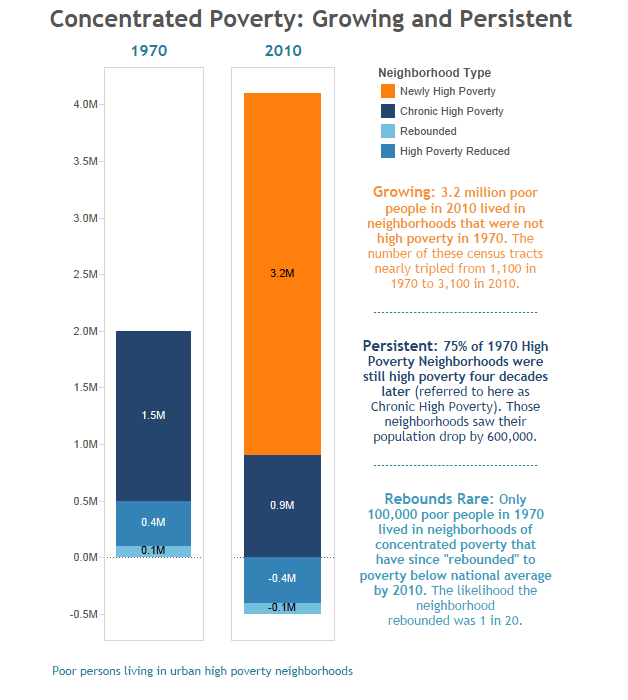 The number of poor living in high-poverty neighborhoods that rebounded since 1970 declined by about 67,000. This is a good maximum estimate of the “displacement” associated with gentrification. Over the same time, the number of poor persons living in newly poor neighborhoods increased by 1,250,000. This suggests that at most, the relocation of the poor attributable to gentrification accounts for perhaps five percent of the increase of population living in concentrated poverty. We’re coming to understand that place plays a big role in shaping economic opportunity. How we build our cities–and whether we allow concentrated poverty to persist and spread–will have a profound impact on whether future generations will continue to share the American dream. For more information regarding economic opportunity, economic segregation, and concentrated poverty, go here, and to see the full report including metro-level dashboards and maps, go here.